Last Chance is a boutique that carries a mixture of women’s, high end and contemporary designer clothes. The small outlet store/ boutique has been in business for 10 years now and continuously supports local brands (Cynthia Vincent, Eva Franco) and loves to give back to the community. Researchers estimate that 1 in 38 children now has autism, but diagnosing the condition is fraught with difficulty. With such a high rate of autistic children, the store wants to give back and help support schools, medical offices and other programs to help the kids. It's a good time to get your shop on for summer frocks and help a worthy cause. I've been to Last Chance in Culver City and they have great stuff. 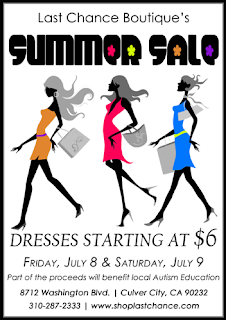 So mark your calendars for July 8th and July 9th to shop there.